After her near-fatal run-in with the Jack the Ripper copycat, Rory Deveaux has been living in Bristol under the close watch of her parents. So when her therapist suddenly suggests she return to Wexford, Rory jumps at the chance to get back to her friends. But Rory's brush with the Ripper touched her more than she thought possible: she's become a human terminus, with the power to eliminate ghosts on contact. She soon finds out that the Shades--the city's secret ghost-fighting police--are responsible for her return. The Ripper may be gone, but now there is a string of new inexplicable deaths threatening London. Rory has evidence that the deaths are no coincidence. Something much more sinister is going on, and now she must convince the squad to listen to her before it's too late. I was careful to leave a lot of distance between us. Blowing up one potential friend by accident, well, that can happen. Blowing up another would be carelessness. Never get stabbed - it makes everything awkward. "You're not weird in the head." "There's a giant talking chicken next to me that would say otherwise." I love The Name of the Star. Maureen knows how to keep her audience entranced and on the edge of their seats. Girl kept it up with The Madness Underneath, the only difference being that I wasn't freaking out until the last few chapters of this novel. 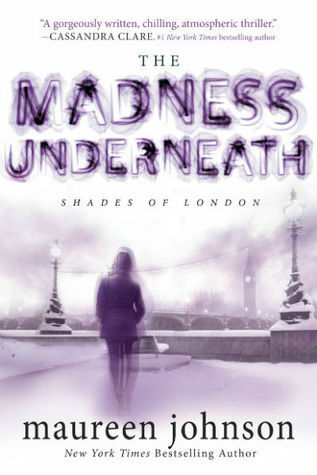 The Madness Underneath has a slower plot than The Name of the Star, but it is no less engaging. With The Madness Underneath Rory is dealing with aftermath of being stabbed and almost killed by the Ripper. I got the feeling through her narrative, that Rory is (more or less) essentially mentally and physically able to handle the situation. One of the scenes I really enjoyed is when Jazza goes into the bathroom with Rory where it all happened and Rory states it's "just a bathroom." This scene alone speaks to the strength and courage of her character, that she is able to walk into the bathroom where she almost died and not be deeply affect. However, despite her desire to return to the pre-Ripper time in her life, Rory's school work is suffering. She had not kept up on assignments during the month she was gone, is unable to catch up, and must continue to lie to those she cares about. Unlike its predecessor, here we are dealing more with Rory's personal struggles more so than with a murdering ghost. I enjoy this look into Rory's personal struggle. Not that I'm glad she's struggling, but we get to know her more on a personal level. When she realizes that perhaps Wexford isn't the place for her, she has a hard time accepting that and becomes desperate to find somewhere she does belong. It it not until the later half of The Madness Underneath that we truly get into the nitty gritty of the mystery at hand and we're back to the familiar suspense found in The Name of the Star. It was at this point that I found the novel impossible to put down. I'm talking, I was reading it while cooking dinner and, since it'd be rude to read during dinner, stared at it until everything was cleaned up and I could once again pick it up. As it stands, I should've listened to everybody who reviewed this novel and waited until we were closer to The Shadow Cabinet's release date. The ending - OMG! That is one of the best, or worst depending on how you look at it, cliffhangers I have ever read. I'm at a loss for words on how to respond to the ending. The Madess Underneath is a great follow up to The Name of the Star. Rory has become a favorite character of mine and Maureen is a wonderful author. She knows how to weave stories to keep you guessing, shocked, thrilled, and in the end, utterly destroyed. That last bit sounds like a bad thing, but it's not. I cannot wait to see how she concludes this wonderful trilogy and I cross my fingers that the release date isn't pushed back again.